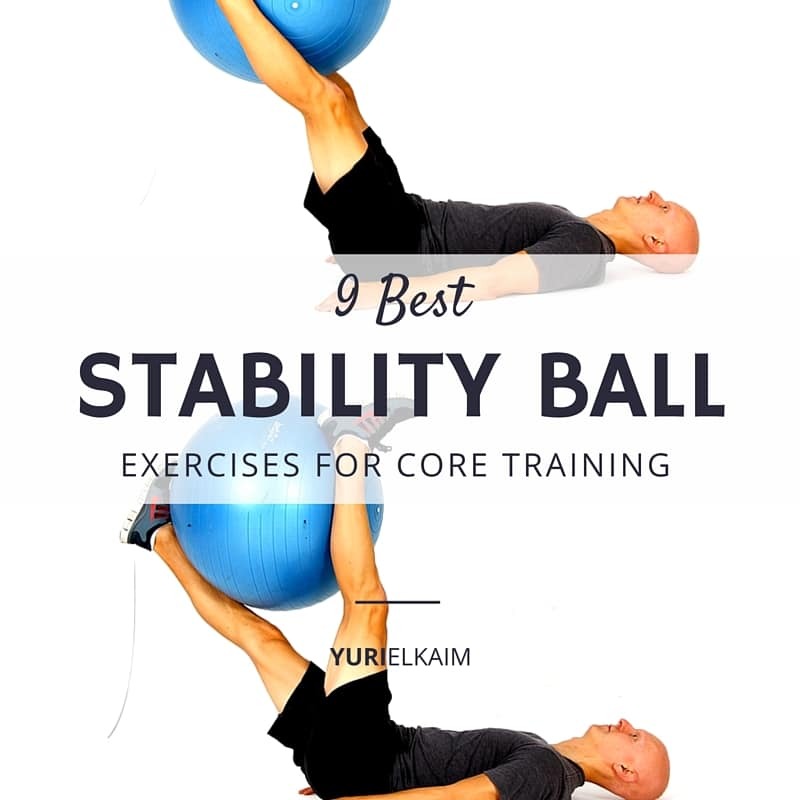 If you’re on the hunt for the best stability ball exercises for core training then look no further. In this post, I’m going to give you the best of the best. No more of those basic “sit on the ball and do biceps curls” or old school stability ball crunches. This is the real deal and only meant for those who enjoy challenging themselves and are serious about getting in great shape and using great stability ball exercises for core training breakthroughs. The 9 exercises you’re about to discover kill multiple birds with one stone, strengthen your entire body within single movements, and challenge your stability and core strength. #1. For each of these core exercises, aim for 10 reps (or 5 on each side where applicable) in a controlled fashion. #2. For added strength benefit (and where applicable) move your body very slowly on the eccentric (negative) phase of the exercise for a 5-6 second count. In most cases, this is where you lower yourself back to the floor or ball against gravity. This eccentric focus allows you to make a basic bodyweight core exercise much more demanding and require a greater activation of your type 2 muscle fibers – all good for building strength and burning fat with bodyweight exercises. #3. Remember, your “core” is defined as any muscle crossing your shoulder or hip joints. Thus, a lot of muscle makes up your core and so that’s why you’ll see leg exercises as well as upper body push-up exercises in this list, too. This is a wicked full body stability and core exercise. To get the most benefit from this exercise, ensure your body is in a straight line from head to toes, your hips are square (parallel to the floor), and that your abs are tucked in and braced. Your hips should not sink at all during the movement, especially as you return to full length from the knees-in position. If you have sensitive wrists, use a pair of dumbbells as your base for your hands and this will keep your wrists in a more neutral position and lessen their load. 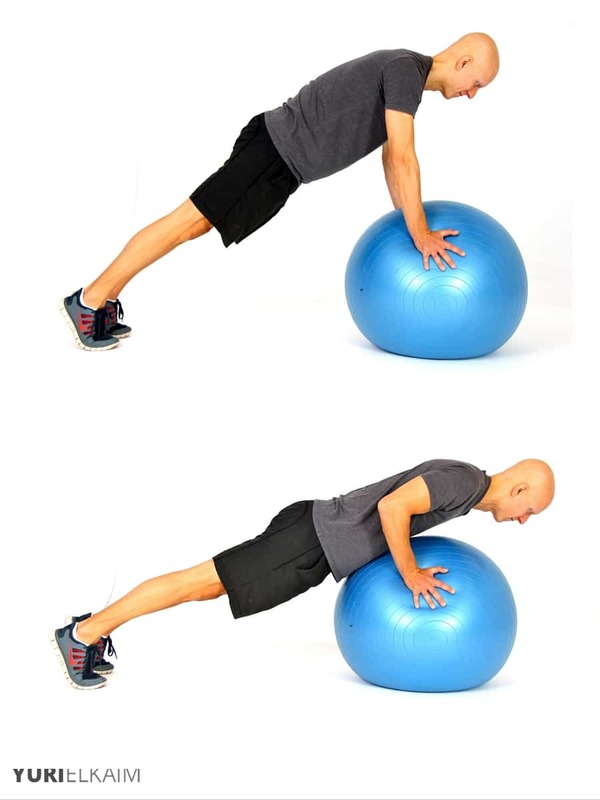 I love doing this push-up variation before any type of chest or pushing-type workout because the unstable ball really gets a lot of neglected muscle fibers firing. You should know that this is a CHALLENGING exercise, so if you’re not comfortable doing it, then please don’t. Keep your hands to the side of the ball so that you wrists are more neutral and lower very slowly toward the ball to make this a good challenge. Just before your torso touches the ball, explosively (yet in controlled fashion) push back to the top. 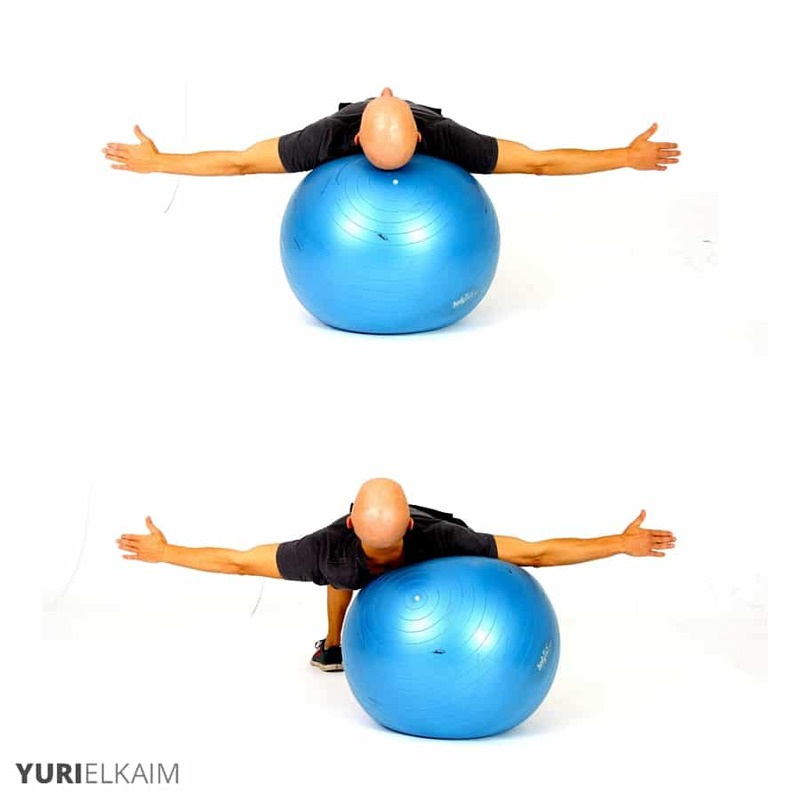 This is one of my favorite stability ball exercises for core development because it’s so deceiving. By that I mean, it looks easier than it is. 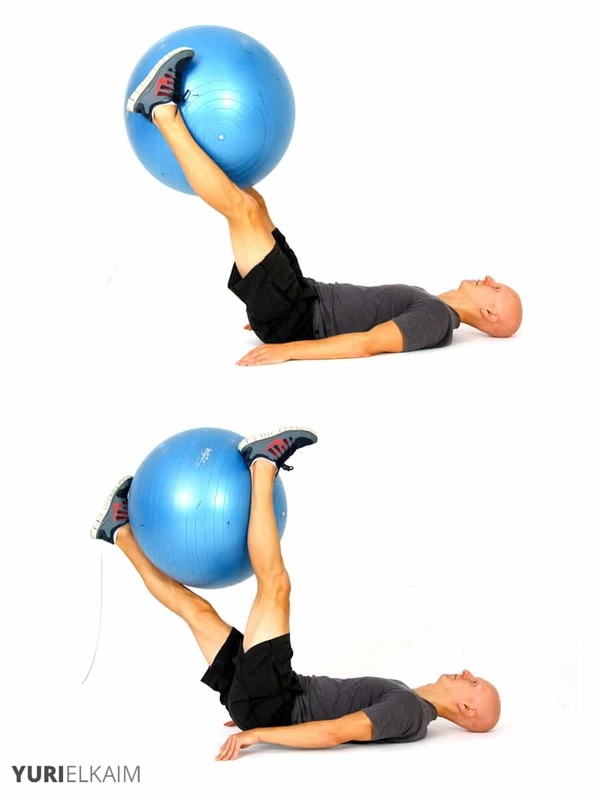 To get the most benefit from this exercise make sure your legs and arms are pressed into the ball at all times. Even when you extend one arm and leg to just above the floor, the leg and arm still holding the ball should be pushing into the ball. This guarantees that more of your muscles are activated and that you’re not just going through the motions. Place your arms out to the side or under the small of your back if more support is needed there. Start with your legs perpendicular to the floor and on either side of the ball. Then twist your legs so that your right leg is at the front of the ball (facing you), while your left leg is on the opposite side (facing away from you). Pause at the end of each twist, then twist again so legs are reversed. This is an amazing exercise for the back of your legs. If you want to firm up those jiggly hamstrings, then do this exercise. The key is to keep your hips elevated the entire time so that your body is in one straight diagonal line from your feet to your head. Dig your heels into the ball as your drag the ball back toward your bum. Squeeze the hamstrings, then return SLOWLY to legs fully extended (remember to keep your hips up). To make this more challenging, give yourself a hug so that your arms are not supporting your bodyweight on the floor. This stability exercise is like a plank on steroids as it challenges all of your core muscles, including your obliques and groins. Start with your hands on the floor, shoulders over top your hands, abs braced, body in a straight line, and feet on either side of the ball, which forces your groins to activate to prevent your legs from slipping off. This alone is a huge benefit. Next, slowly twist your hips to the right so your foot grazes the floor. Use your obliques to pull your hips back square and then over to the other side. Remember to keep your hips elevated at shoulder height the entire time. If you’ve done any amount of core training, then the basic plank is probably pretty easy for you. Most people get this exercise wrong by digging their elbows into the floor which is a CHEAT and negates a lot of the benefits of doing it properly. Here, I’d like you to dig your forearms and especially your wrists into the ball. This alone will increase your core activation 10-fold. Draw in and brace your abs, keep your hips up, and glutes and quads contracted. Then, simply move the ball around in a small circular motion moving only your arms. Your entire body should remain still like cemented concrete. As you move the ball through that circular motion you’ll feel different muscles in your core activate at different points of the movement. To make it more challenging, draw a bigger circle. But remember to keep your body as solid and still as possible. I discovered this exercise back in the day when I was working with some NHL athletes. The ball should be under your head and shoulders and feel like a pillow, while your arms are outstretched to the side and fully engaged/contracted. As with all of these stability ball exercises the key with this one is to ensure that your hips are up and your body is in a straight line from your knees to your shoulders. Enter your glutes, which in their contraction extend (or push) your hips up. As you move laterally a few inches to the left, you’ll instantly feel your right glute contract big time. You’ll also notice the left side of your lower back fire up as well, which reminds us of the intricate contralateral (cross) connection between our glutes and low back. NOTE: You can feel the same activation pattern when standing on one leg. If standing on your right leg, your right glute will fire as will the left side of your back. And vice versa. To make this exercise even more challenging, once you’ve reached your balance limit to either side of the ball, lift the opposite leg off the floor. Boom! Feel the difference that makes. In my humble opinion, this is the most challenging push-up because it significantly challenges your core, upper chest, shoulders, and triceps more than any other push-up variations. I would recommend holding onto dumbbells at the floor to keep your wrists more neutral especially as you lower into the push-up. It’s a pretty easy movement, as you lower down, draw your knees in towards your wrists. This will naturally roll the ball in as well. But the real test begins when you push yourself out of this “tucked” position. Give it a shot and see for yourself. 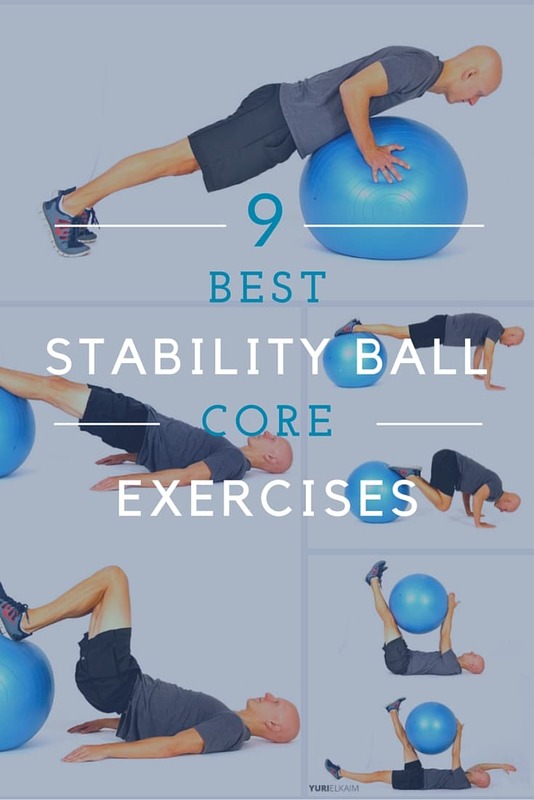 Before we wrap, let’s bring all 9 of the stability ball exercises for core training together into a nice little workout routine. Here, we’ll do a 9-exercise circuit with little to no rest between exercises, which will make this more of a metabolic and fat burning workout, without the need for cardio. Perform 10 reps at each exercise (5 on each side where applicable). No rest between exercises, 1 minute rest between sets. Complete 2 sets. Warm-up: 5 minutes of light cardio followed by good dynamic warm-up. There you go. Give this workout a shot and enjoy the core sculpting benefits. 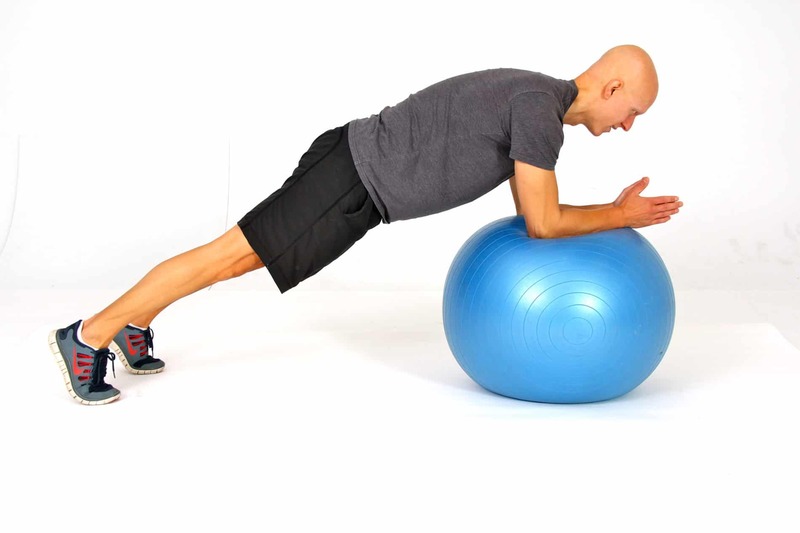 Did you enjoy this article on the 9 Best Stability Ball Exercises? If so and you want to take your abs and core to the next level, then I’d invite you to download my FREE report called the Flat Stomach Secret. It’s packed with 7 unknown ways to lose belly fat and get amazing abs.